Buy Weleda Salt Toothpaste 75ml in the UK from our online shop or directly from our independent Scottish store. INCI: Sodium Bicarbonate, Water (Aqua), Glycerin, Silica, Mentha Piperita (Peppermint) Oil, Prunus Spinosa Fruit Juice, Commiphora Myrrha Resin Extract, Krameria Triandra (Ratanhia) Root Extract, Aesculus Hippocastanum (Horse Chestnut) Bark Extract, Arum Maculatum Root Extract (in highly diluted form), Sodium Chloride, Cyamopsis Tetragonoloba (Guar) Gum, Simmondsia Chinensis (Jojoba) Seed Oil, Alcohol, Esculin, Lactose, Flavour (Aroma), Limonene*, Linalool*. *from natural essential oils. As official Weleda stockist, we sell genuine Toothpastes directly from our shop in Scotland and online throughout the UK. Where can you buy real Salt Toothpaste safely online? If you are wondering where you can buy Weleda Salt Toothpaste 75ml safely online in the UK, then shop with us. We are an actual health foods shop; with real people selling real foods and products. Our award-winning independent shop is located in Stirling, Scotland since 1976. You can buy our Natural, cruelty free skincare. Homeopathic remedies and other genuine Toothpastes in store or safely place an order with us online or over the phone. 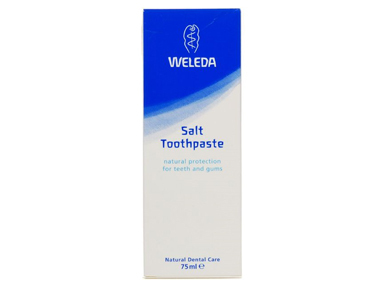 Salt Toothpaste - Weleda Salt Toothpaste 75ml in Toothpastes and Dental Care.